If you’ve found yourself asking any of the above questions – fret not – I’m here to answer all of your “ what to wear in Morocco ” questions – followed by some photos, as well! Short answer: wear what you want. But, yes. You can wear whatever you want. 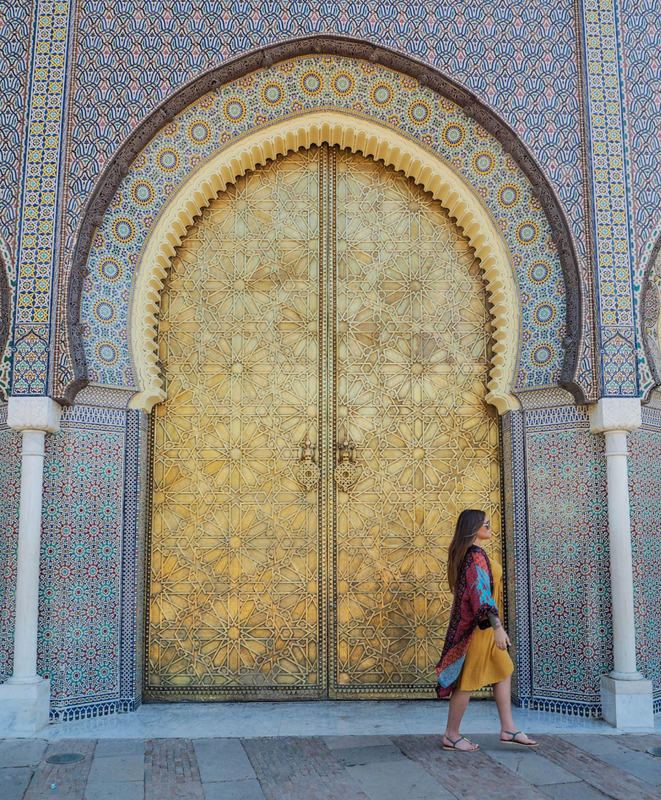 Long answer: There are a few realities of Morocco that stir up these wardrobe questions… one fact about Morocco is that nearly 99% of its residents (according to Wikipedia) adhere to the religion of Islam. 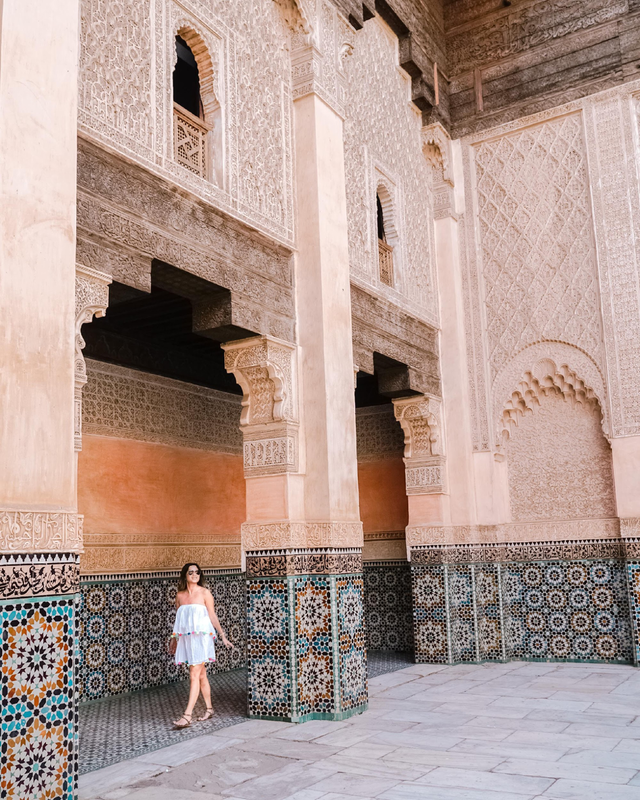 Since many traditional Islamic countries require the women to cover their hair, shoulders, knees and in some very traditional countries even ankles and face – Morocco comes with assumptions of how a woman should/has to dress. 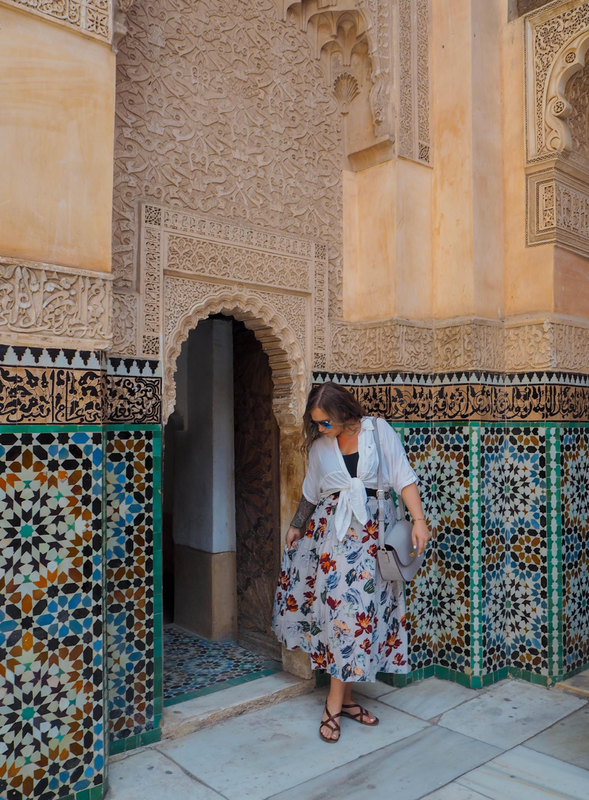 Being that I thought the rules were strict in Morocco prior to my arriving there, most of my outfits cover my shoulders and knees like this ensemble at Ben Youseff Madrasa in Marrakesh. Here I am again, shoulders and knees covered, at Dar el Makhzen Palace. However, another fact about Morocco is that it’s an extremely liberal country. 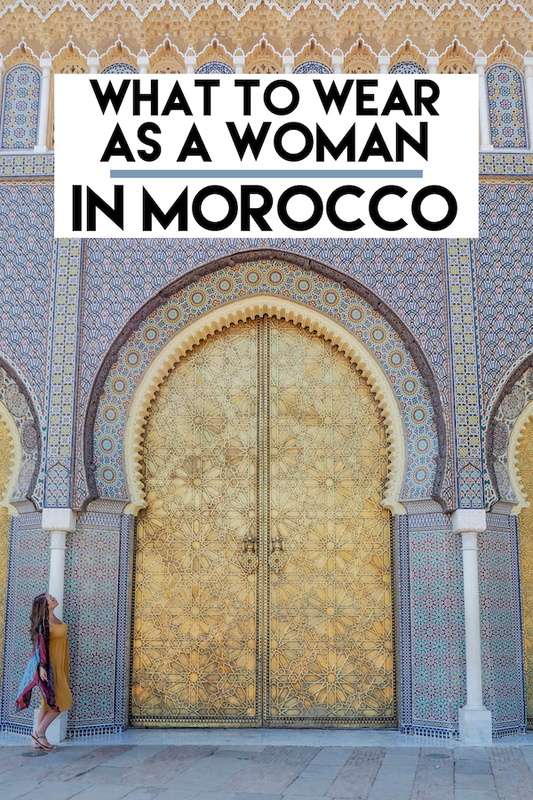 On my first day in Morocco I was shocked to see local women wearing short skirts and crop tops (as I had heard/read that you must cover your shoulders and knees when in public). However, local and tourist women alike were bare shoulders, knees blaring, with hardly anyone blinking an eye! Exposed cleavage or provocative clothing may warrant some unwanted (or, perhaps wanted – no judgement here!) cat-calls – but this is no different in my home city of New York or some of my favorite cities in Europe (Paris, Milan, etc). Something else to consider – the weather. It is HOT in Morocco. When packing for your Morocco trip try to remember to pack light, loose clothes. Opt for airy kimonos, linen and light cotton options. 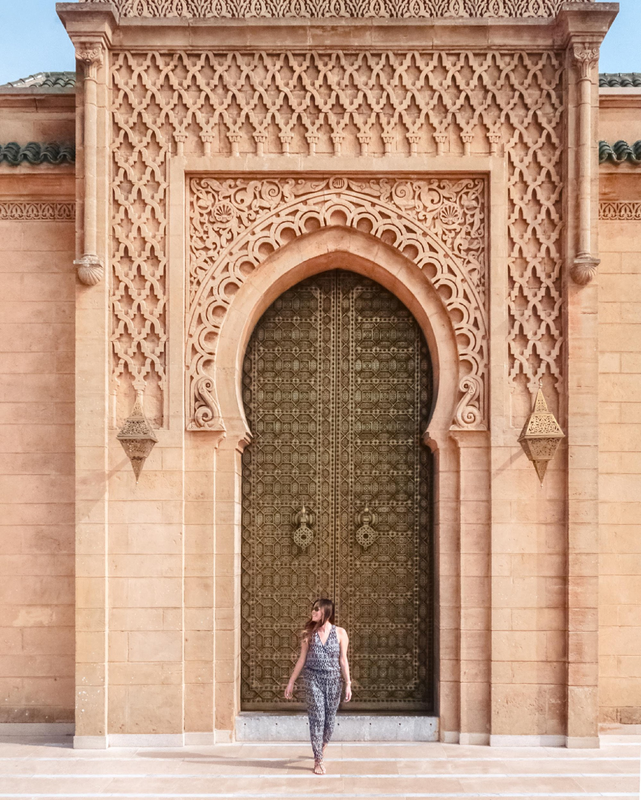 Christine felt completely comfortable while exploring Ben Youseff Madrasa with bare shoulders and exposed knees. Here’s another of Christine, casually comfortable at the Mausoleum of Mohammad V in Rabat. Here’s Zory sporting a GORGEOUS dress with a fun slit in the Sahara – shoulders and knees bare and not a care! Zory again with shoulders and knees exposed, comfortably, in Fes at Bou Inania Madrasa. Here I am after learning about the “loose rules”… I was happy to let the cover-up go! 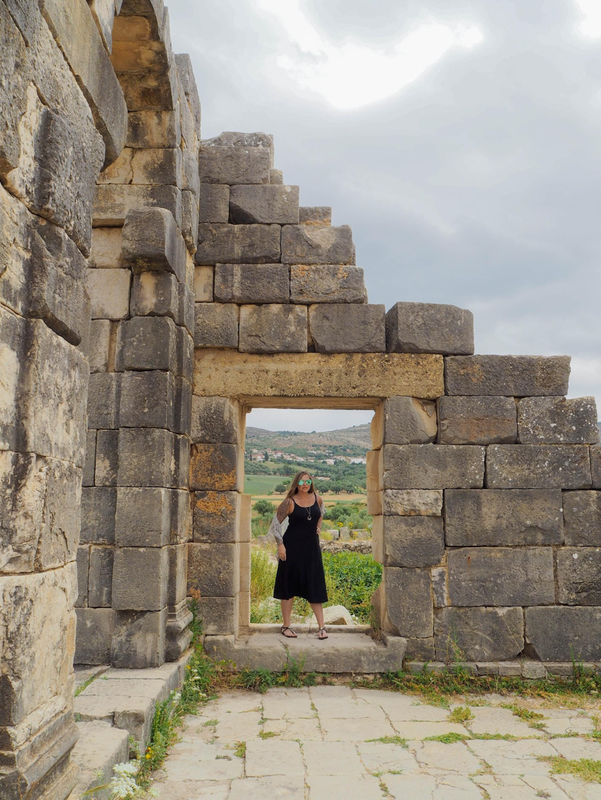 This was at the Roman Ruins at Volubilis, and it was H-O-T. However, although I became quickly aware of how liberal Morocco was I still tried to remain respectful to those citizens of Morocco who may not be as liberal as their government is. It was not unusual to see a woman in a complete abaya – or aba – (which is a robe-like dress that covers most of a woman’s body) and it’s also typical to see a woman in a hijab which covers their face and hair with the exception of their eyes. I, personally, wanted to remain respectful for those women and I covered up for most of my trip in Morocco. 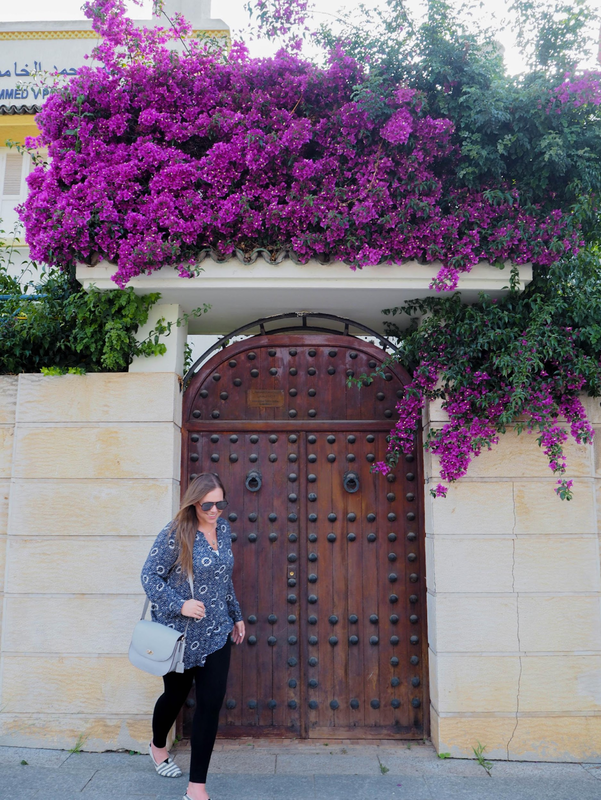 Here I am on my first day in Morocco (in Rabat) almost completely covered from ankles to neck. Here I am just outside of Aït Ben Haddou, near Ouarzazate, remaining fashionable while still covering my knees and shoulders. I still stand my short answer when it comes to “ what to wear in Morocco ”, whatever you want! Be comfortable, be you – the same way the locals are! *Disclaimer: I was hosted in Morocco as a guest with Visit Morocco – Moroccan National Tourist Office. My opinions, as always, remain my own. Gorgeous! 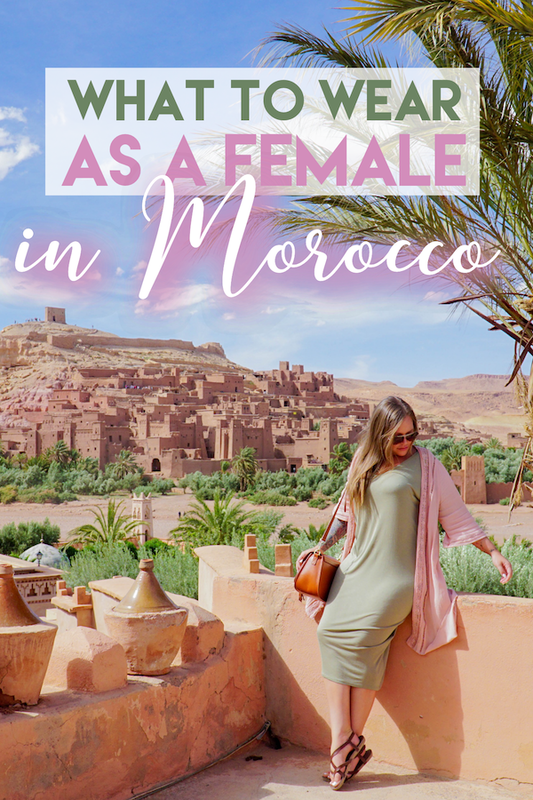 We lived in the middle east for 3 years and never made it to Morocco, which I so regret! One day! It’s funny how many misconceptions there are about dress in Muslim countries, eh? I can’t believe how many misconceptions there are! And I hope you get to make it to Morocco! It was such a great experience! Great post! I love that it’s really possible to wear anything…I probably would feel more comfortable covered up a bit, but it’s nice to know that on a super-warm visit it’s not necessary! I totally felt more comfortable covered up but check out some of the other comments on this post as some other ladies have had much different experiences than I did! Your photos are amazing! And felt the same way when I was in Morocco! Ah I am glad you wrote this. And that you addressed the fact that cat-calling can happen anywhere. I think its important to wear what you want and respect the culture, which can often be hard but I always try to do both as best as I can. Great post! I honestly get more cat-calling in my home city of NY than I did anywhere in Morocco, but feel free to check out some of the other comments on this post! Some ladies had much different experiences than I did! Thanks Nina! I totally thought covering up was a requirement, also! I was definitely with a group of respectful people and I think that totally affected our experiences. Check out some of the other comments as some ladies had much different experiences than I did! Thanks so much for chiming in with your experiences Katie! I think our experiences were very different and I’m sure it had to do with the fact that I was with men for most of the time. I’m glad that you didn’t let the cat-calling and unwanted attention get to you or ruin your trip and that you still loved Morocco! Interesting post. How long did you stay there for? Great article Jackie! And your outfits are the CUTEST! I love how you touched on the fact that while you can feel comfortable wearing whatever you want, you still need to respect the local culture! The one thing I will note though, as someone who traveled to Morocco both solo AND with a group of friends, it was like a night and day different experience. When I was solo, I covered up as much as I could and STILL got harassed like crazy. It was very unpleasant and I wouldn’t think to dress the way I dress at home. However, when I was with my friends, it was completely different ballgame and I felt comfortable showing my shoulders a little bit when we were in the super touristy areas (Although I covered my shoulders with a shall when we were in the more local areas out of respect). It was hot AF, but still didnt want to disrespect and get unwanted attention. So i think different rules apply when you’re solo versus in a group. But overall, you still don’t have to dress like a nun :). All the outfits were perfect for the set up they were in! Bare should little dress was really cute! 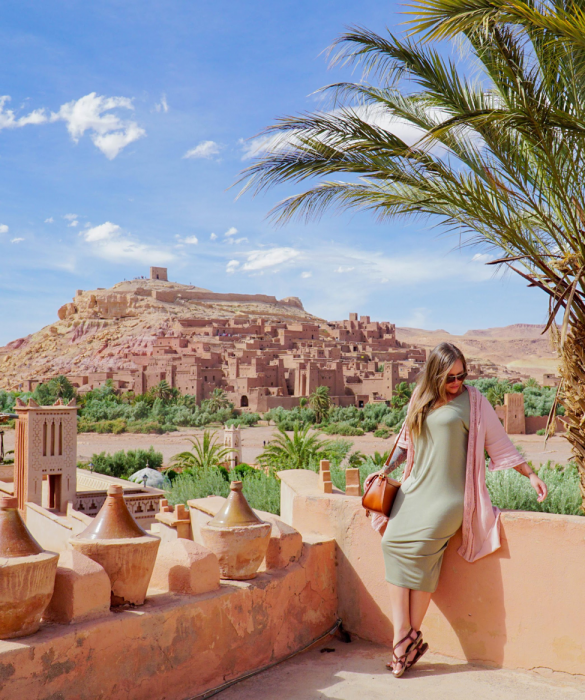 Morocco is such a gem and beautiful place and you showed it incredibly well in this compilation of pictures! I felt so uncomfortable in Morocco to begin with, so I definitely didn’t try to draw attention to myself because of my clothing. I always kept my knees and shoulders covered and yet I still garnered some disgusting sexist cat calls. Your experience was clearly way different than mine, but I’m glad you loved it! Yeah, I did the same just out of respect. I agree with you Taylor- I dressed respectfully but I have long blonde hair and I guess it cause attetion because as soon as my husband stepped away from me I got many lewd looks, comments and I wasn’t the only one in our group to get that. One young attorney was cornered and harassed in the market to the point of tears. Not saying Moroocco is bad just saying don’t be naive. It’s unfortunate we had different experiences! What a great post! I’ve always read that you have to cover up while in Morocco. I think I’ll probably still dress pretty modestly if I ever go, but it’s good to know that it’s not a requirement! I was really shocked to hear/learn that it wasn’t a requirement! Brilliant idea for a post 🙂 I love the outfit here… it is so cute! I thought covering up was a requirement !! It is important to wear what you want and respect the culture, which can often be hard. However I always try to do both as best as I can when visiting a country. Thanks so much, doll! I thought it was a requirement as well, but even though it wasn’t I still covered up the majority of the time. First of all, you and your friends look GORGEOUS! It’s so nice to hear that the clothing rules are less restrictive than I thought. I’d probably still dress a bit conservatively, but I usually do when visiting religious/cultural areas. This looks like an amazing trip! Thanks so much Marcie! I still did, as well, for the same reasons! Great fashion from you ladies! You’re all looking good! It’s always great to hear that you have options and have a little bit of freedom. Morocco is high on my list and I expect to make it there this year, and I know I will be prepared. I am like you and would want to stay cool and be myself, but also respect the culture. Gorgeous photos! And add me to the chorus of people who had no idea Morocco was so liberal. And I’ve even researched a trip there (that didn’t happen) so I thought I was pretty well informed. I’m usually not one to spend a lot of time researching clothing ideas before visiting a country, but now I’m thinking I really need to start! I’ve got a friend heading to Morocco soon, so I’m going to share this with her, too. Love this perspective of Morocco. I have been to the Middle-East and some countries like Jordan continue to surprise me with their relatively liberal spirit. Morocco seems to be the same. Also all the pictures and outfits are gorgeous. Beautiful photos and great tips! I can’t wait for my trip!